For anyone working in marketing or anyone just pretending to like football, the Super Bowl is all about the commercials. This year Acquisio discovered just how valuable video ads can be for a company or a growing agency, and with more of our focus shifted to video ads it’s only natural that we look at the Super Bowl to see what it takes to make a great video ad. 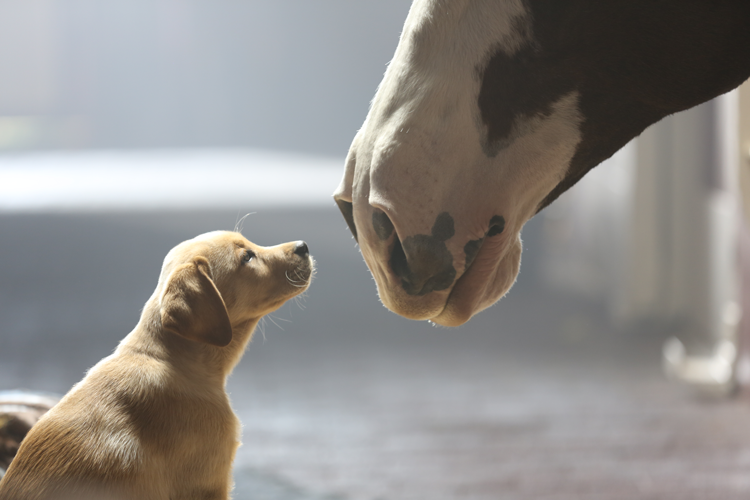 Long-time Super Bowl champions, Budweiser, had the best Super Bowl ad two years in a row with their heartwarming “Brotherhood” and “Puppy Love” ads. The best ads of the Super Bowl can be judged in two ways, engagement (including commercial views, shares online pre and post-game and comments shared via hashtags on social media) and sales. We want to know if these 4 million dollar commercials actually helped generate more sales for the brand. Budweiser not only has provoked consistently positive response online over the past few years with their ads, but sales have increased as well. Their first in a series of heartwarming ads, “Brotherhood” was effective at generating more sales. A study performed by Communicus, which followed consumers’ purchase behavior before and after Super Bowl 2013, proved that 1 in 5 Super Bowl ads didn’t boost sales, yet the most successful ad of the study was “Brotherhood” which expanded people’s preference for the brand and purchase intent. With last year’s “Puppy Love” ad, there was a 37.8% increase in likelihood of purchase according to an analysis from Ace Metrix. On top of that, the ad has more than 55 million views, making it the most viewed ad of Super Bowl 2014. 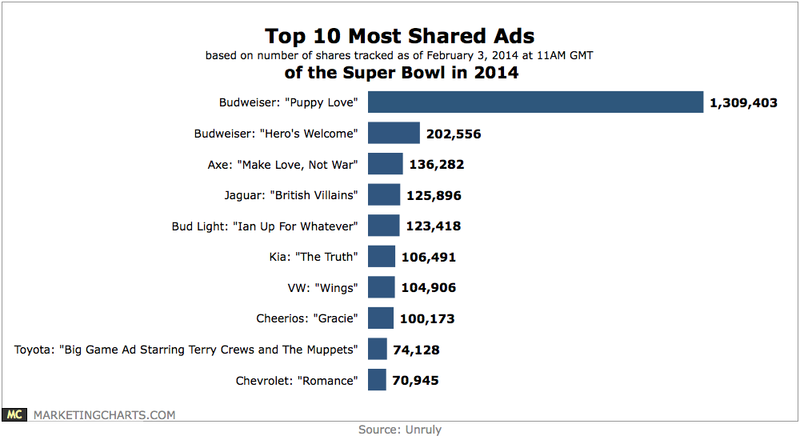 “Puppy Love” was also the most shared ad of the Super Bowl, shared more that 1.31 million times in the following two days after the game. Budweiser has already taken to Twitter to engage users online, asking them to follow the lost pup on Twitter and share updates on his whereabouts – offering a pair of tickets to the Super Bowl as incentive. What’s funny is that another Super Bowl fan favorite, Go Daddy, this year created a spoof of the Budweiser ad, it seems. Turns out people didn’t take too kindly to this ad, launching a change.org petition to take it down. The petition has more than 42,000 signatures so far from people who don’t think promoting puppy breeding is appropriate. As a result the ad will officially not air. So what’s the takeaway? The formula seems to be: generate buzz on social and create something memorable (and don’t step on anyone’s toes). Then hope it generates sales. For major cruise line Carnival, this marks their first time airing an ad during the Super Bowl. The company likely want to rebuild their image after some of the disastrous incidents over that past year. To choose the right ad, the company launched a contest with 6 different ads and viewers were asked to vote on their favorite. Of course none of the ads addressed the issue of the “poop cruise” where passengers were stranded on a Carnival cruise for 5 days without working toilets. No poop jokes in these ads, it’s all about the joys of cruising. Time Magazine reported that just 4 months after the incident sales were up and Carnival cruises were fully booked, so maybe all is forgiven and these ads are just the trick to give sales another nudge forward. We’ll have to see. Another newcomer to the Super Bowl line up is Avocados from Mexico. This is a big first for the game since no fruit has had the spotlight during the event before. The lighthearted ad is said to be an attempt at shifting to a more health conscious nation, promoting something other than beer and chips. 70% of the avocados sold in America are from Mexico, so whether this ad will promote more Mexican avocado sales, avocado sales in general or nothing at all is yet to be seen. To make this ad successful, in terms of engagement and sales, Avocados from Mexico teamed up with Old El Paso to create the Guac Fiesta campaign, which includes contests, coupons, social media engagement, in store displays, radio ads and new packaging. If this Super Bowl ad works out and boosts sales for Avocados from Mexico it’s definitely due to all the company’s cross platform efforts. After the Super Bowl, we’ll look at which ads grabbed viewer’s attention and whether or not pay-per-click campaigns were launched by some of the big companies to complement their video ads.